Women aren’t stopping their passion for sports at the collegiate level, some strive to play at the professional level. 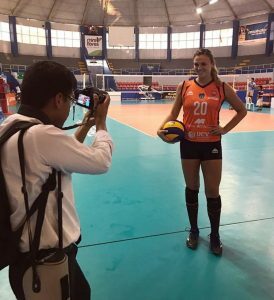 Brenna McIntosh, former Coyote women’s volleyball star and three-time All-American, is currently living her dream playing professional volleyball in Peru for the Cesar Vallejo University (UCV) Deportes. The Deportes play in the Liga Nacional Superior Voleibol (LNSV) which is the top league in Peru. Her talent isn’t the only thing that got her to the high level she is playing at now. It takes much more than that to make it as a professional athlete. Dedication, determination and perseverance are just a few assets that helped her achieve success. “I am so passionate about volleyball and I always wanted to play at the highest level possible,” stated McIntosh. After breaking her foot during her senior year at CSUSB, she knew she wasn’t ready to end her volleyball career just yet. Her road to the professionals involved signing up with an agency and putting together a highlight tape (reel). McIntosh’s agent sent her reel to several countries. Deportes gave her an offer, and she decided it was the right fit for her. Like many professional athletes, McIntosh’s life is now devoted to her sport. She trains two times a day and plays on the weekends. She gets her housing and living expenses paid for, on top of a monthly salary. “I’m able to travel for free while getting paid to play the sport that I love,” stated McIntosh. With Spanish being one of the official languages in Peru, and her coach only being able to speak some English, McIntosh has had to adjust. She receives help from a bilingual teammate. She does not shy away from a challenge and is eager to learn from her teammates. “It’s definitely a learning experience,” stated McIntosh. Within just five months of playing professional volleyball, McIntosh has been to Siberia, London, the Maldives and Peru. She is not ready to hang up her shoes quite yet. Once her contract with the Deportes is up, she is hoping to continue playing professionally. McIntosh is getting to experience so many opportunities that the average person doesn’t get to. “I’ve met so many amazing people and I feel so blessed to be in the situation that I am,” stated McIntosh. In addition to volleyball, female athletes also continue to participate in softball, soccer and even pursue careers as coaches, officials and scouts for professional sports teams. For softball players, there is National Pro Fastpitch, which has teams from all over the United States. The women’s soccer team now has a representative playing professionally. Former Coyote defender, Megan Todd is now playing as a midfielder for the Acle United Ladies Football Club in England. Becky Hammon, assistant coach for the San Antonio Spurs became the first female in the NBA to work for a full-time salary. Along with coaching, females are breaking into male dominated sports by working as referees. Sarah Thomas became the first female NFL official in 2015 and now has a full-time position. Lastly, Amanda Hopkins made her way into the Mariners organization as a full-time scout. Before her hire, she was an intern for three summers in a row. Just because the world of sports doesn’t have too many females in it at the moment, doesn’t mean women aren’t trying to flourish in the industry. Anything is possible with enough hard work and determination.